Who hasn't had a dream about being a princess? I'm sure that many have, but it doesn't come true for most. Sure, there are those few that marry into a royal family, but what if you found out you were a princess by birth and no one had ever told you? What if you had recently quit your job and were pursuing your dream and suddenly someone comes to you and tells you that you are a princess, an heir to a throne? That is what happened to Regina Beswick in Princess Ever After. Rachel Hauck does a great job telling the story of Regina "Reggie" Beswick. She creates characters that you can't help but find yourself attached to. You find yourself cheering her on as she finds a love for not only her grandmother's home country but also a love for her life. Reggie relies on her faith and prays for signs to help her make the right decision about her future. You feel the emotions that Reggie is feeling, as she comes to terms with her true ancestry and determines where her future lies. 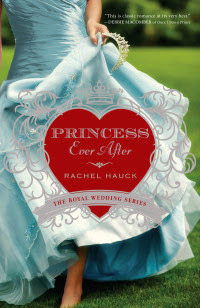 Princess Ever After is the first book by Rachel Hauck that I have read and I am ready to read another. I really would like to read another installment about Reggie, but am not sure that there will be another one, so I might have to check out the first book in the Royal Wedding Series or one of her many other books. Learn more about Rachel Hauck on her website.